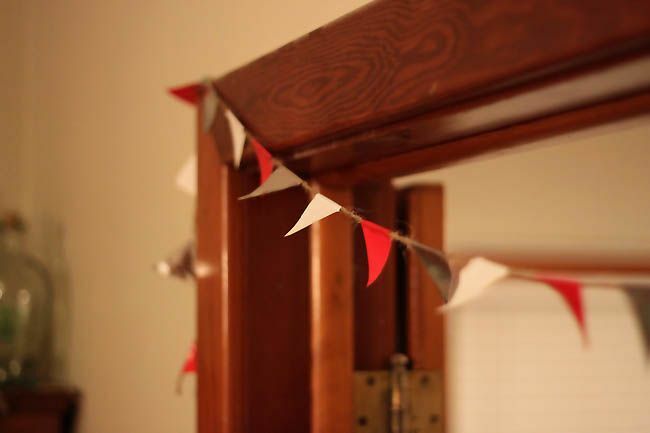 I'm in love with pendant flags right now. I'm sure you've seen them everywhere too. On cakes, cupcakes, paintings, t-shirts, etc. I had one in mind that I wanted to make for Christmas. It's duct tape. Yup! Duct tape! Did you know they make it in crazy cool patterns now? What I wanted to do was a banner with alternating black/white zebra tape and red. It would be so spunky and fun! And wouldn't you know when I went to get the zebra duct tape it was sold out. I could've picked a leapord or camoflauge (*shudder*) pattern, but I went a little more classic instead. I used twine already on hand, placed sections of duct tape on it in alternating colors, then cut them into triangles. Mine is about 72" long and took about an hour to make while I was watching HGTV. If you used ribbon rather than twine, it would be easier to keep them all pointing down in the right direction. Mine twist and point up and out, but I'm okay with that. It is so cute and shimmery and easy and cheap. Would you decoratate with an animal print for Christmas? Or am I crazy? LOVE IT! and so easy, just time consuming, but so cute! and yes, i would decorate in animal print :D in fact, i think i need to do this project! Yes, you ARE crazy. But it has nothing to do with decorating with animal prints for Christmas. I do something similar but I make fabric triangles and sew them on ribbon. For my son's 2nd birthday I put one letter of his name on each triangle and then a 2 on one. 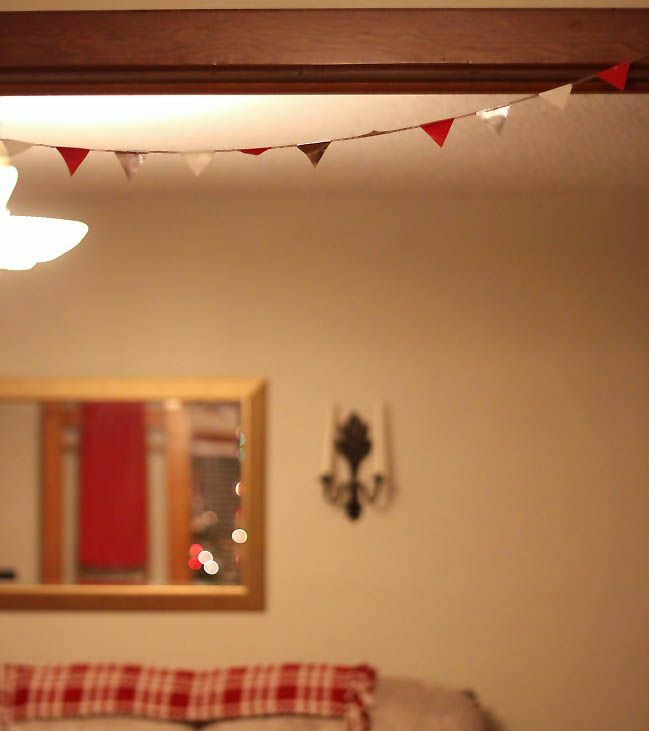 The banner is so cute that I have it hanging in his bedroom. Duct Tape! My husband would love this, maybe I could actually get him to even help with it - how fun & simple. I like simple! That is awesome..are you crazy?...not at all! Btw, I gave the key chain you made for me to its new owner the other day. It was perfect and he told me I really had no idea how special it was to him! Thanks! 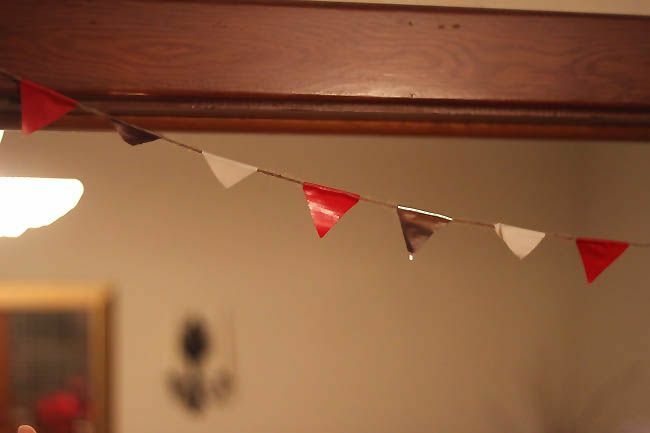 I love pennant banners...my birthday is coming up, and I made myself some pennant cake bunting & a birthday banner to hang up. Hurray! as of tonight, the zebra is back in stock! :) super cute!!! i mixed animal print ribbon (zebra and leopard) in with red and lime green solid wrapping paper last year and everyone loved it. not sure I would hang it up in the house though.